If you have an emergency at any time of the day please call us immediately. Veterinary assistance is close at hand for your pet’s benefit, 24-hours a day, 365 days a year. You can telephone 020 3865 8905 even when the clinic is closed. Sometimes it can be difficult to spot the signs of a true, life-threatening emergency. If you do have concerns, it is best to call straight away and seek professional veterinary advice that we are happy to provide. The out-of-hours service is intended for registered clients of Two By Two Veterinary Centre but is extended to all genuine emergencies when required. There is an additional out of hours registration fee of £35 for clients of other practices wishing to utilise our emergency service. All treatments will be charged with an out of hours premium applied to the fee structure utilised during opening hours. As always, cost estimates for investigations and treatment are available at the time of consultation with the attending veterinary surgeon. The majority of emergency out-of-hours assistance is provided in-house by calling 020 3865 8905 . However, there will be rare times when your phone call will be directed to contact Wood Street Animal Hospital, a dedicated emergency service based at 74 Wood St, Barnet EN5 4BW. They can be contacted on 020 8449 0074. 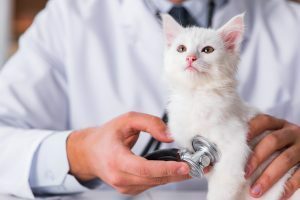 On these occasions, when the clinic re-opens the following morning, you can choose to continue your care at Wood Street Animal Hospital, or transfer your pet back to Two By Two Veterinary Centre, assuming your pet is fit enough to be transported. Remember, don’t delay in contacting Two By Two Veterinary Centre for veterinary help, even if it’s just for phone advice.